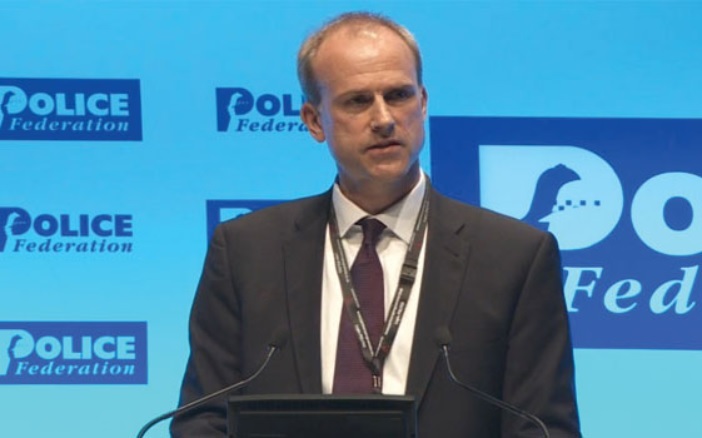 Chief constable Anthony Bangham, the NPCC roads policing lead, has moved to clarify remarks he made during last week’s National Roads Policing Conference. Mr Bangham faced controversy following widespread media reports that he suggested that drivers travelling at just one mph over the speed limit should be prosecuted. However, in a blog post published on the National Police Chiefs’ Council (NPCC) website, Mr Bangham says the focus on the one mph issue detracted from the real point he wanted to make. 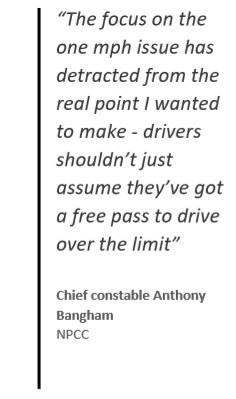 Mr Bangham’s blog reads as follows: “The focus on the one mph issue has detracted from the real point I wanted to make – drivers shouldn’t just assume they’ve got a free pass to drive over the limit. “Comments I made last week have led to a perception that the police are going to be pursuing and prosecuting drivers just one mph over the speed limit. That is not the case and was never advocated – and I now need to clear up the misunderstanding. “Firstly, the background. Last week I spoke at the National Roads Policing Conference, which brings together police officers specialising in roads policing to discuss and debate issues, joined by media colleagues. “Everyone at the conference was concerned that we are seeing an increase in deaths and injuries. On average five people are killed and 66 seriously injured every day in road traffic collisions. “Part of my role as the national police lead for roads policing is to strive for ways of reducing those numbers and making our roads safer, and I take that responsibility very seriously. “In that context, at the conference I was asked about speed limits and the so-called ‘buffer zone’, which has developed over time and means the public expect that they are given a leeway of 10 per cent plus two mph over the limit. “I said we should be clearer with the public that the limit is set for a reason and you can be stopped and action taken against you when you are over it. “The logical conclusion of that argument, and the way it has been widely reported, is that we’re going after people just one mph over the limit. I now want to be clearer on this point – our aim is not to be pursuing drivers one mph over the speed limit and putting them through the courts. This would not be proportionate or achievable. “Police enforcement is always intelligence-led, proportionate and applied with common sense. The focus on the one mph issue has detracted from the real point I wanted to make – drivers shouldn’t just assume they’ve got a free pass to drive over the limit. The limit is the limit. “Officers have discretion to act based on the circumstances. There may well be occasions where someone is speeding a couple of miles over the speed limit outside a school and an officer could reasonably decide it is proportionate to stop them. “Our priority for action is always going to be the most dangerous drivers but the reality is many drivers now routinely drive above the speed limit. Of course common sense must be applied, but there should not be a ‘comfort zone’ over the speed limit where it is considered safe to speed. The limit is the limit for a reason. What concerns me is that the police in my City have over the last three years fined 12 cyclists of which only a couple were riding on the footway, however they fined multiple thousands of motorists for speeding. There is I believe a MANDATORY £30 fine for riding a cycle on the footway. In Hull there are thousands of cyclists riding on the footways every day illegally, some at speeds in excess of 20MPH. Scaring Pensioners, School Children and the General Public who usually have to move safely to one side to avoid collision, they ride with no lights at dusk or at night, wearing headphones and or talking on their mobile telephones. Yet the Police turn a blind eye to this crime these days, WHY? Well if you allow cyclists to break the law and ride on the footway, your accident statistics for road accidents will improve will it not Mr CC? So I wonder why the police never bring up this topic with regard to Road Safety? If you let half of the cars drive on the footway, it will also improve your statistics (that too I believe would constitute a punishable crime) Rules for one and not the other. They say that if a speed camera site is found not to be controlling the speeding traffic, then the effectiveness of that location is reviewed and alternatives arrangements made. In my city, we now have camera operators hiding in lay by’s, Operators wearing all black clothing including commando style wooly hats, no high vis clothing on show and no hi vis markings nor lettering on the van facing the oncoming traffic. And this is the answer to a failing system? May I suggest you do not always blame the motorist and look to the methodology. The speed cameras are not working as well as you thought, so you blame the motorists for en masse altering their driving techniques. More police on the beat, more police cars on the roads…That used to work, however I believe there was a cost implication… So perhaps we could say “It’s all about the money” quite legitimately. Two things that cannot be disputed, if you are driving at one mile an hour and hit something, speed/velocity will be a factor of that incident/accident. If you are doing no miles per hour, then it will not be a factor. And if you insist that driver focus constantly on their speedometers, they will eventually hit something, and you will say again it was speed that caused the accident. A win win situation. The +10% +6.25mph is solely associated with the EU-wide harmonisation of the specification and approval of motor vehicle equipment. In this case speedometer. It has no bearing at all on the police enforcement thresholds which vary from country to country. However, all police forces across the EU can be sure that speedometers in vehicles that do meet the EU requirements will never under-read the speed. Hence your comment has no truth in it whatsoever. On either issue though, any outcries would surely only be from those who were in the habit of drink-driving and/or speeding? If this uncertainty over tolerances leads to a bit more self-discipline and compliance, then perhaps the CC knew what he was saying after all. It doesn’t say anywhere that a motorist has to drink just enough to be below the drink-drive limit (but no more), nor to drive up to the posted speed limit (but no more). Hugh: Imagine the outcry if people realised that a your hypothetical 10% tolerance for anyone over the drink drive limit is actually 4% lower than the current tolerance for drink driving (14%), if the test is via breath only. Lets not forget and get it right from the start It was originally an EEC directive that they were obliged to follow or adopt so its not as if they were acting alone. All police forces followed suit and as stated before it was agreed that it should be 10% plus 6.5 mph but they the ACPO. decided on a lower limit of 10% plus 2 mph. One could say that were forced into the situation by politic’s beyond their control. Conversely, imagine the outcry if a chief police officer had said there should be 10% tolerance for anyone over the drink-drive limit. 2) The “evidence” argument. Mr Bangham suggests speed limit enforcement will “keep roads safe”. IOW it’s an outcome argument, if we do speed enforcement, then there will be fewer collisions. The problem with this is that the evidence suggests that this may not be true. It would be cheap and easy to run scientific trials of speed enforcement and, if fewer collisions were achieved, Mr Bangham could then use the “evidence” argument to back up his “opinion” argument. Mr Bangham must surely be in a position to order that his speed enforcement be run within RCT scientific trials. I challenge Mr Bangham to run those trials and thereby prove what the facts are.